Perfect for outdoor grilling season, this grilled naan pizza recipe is bursting with the fresh flavors of tomatoes and tangy feta cheese. 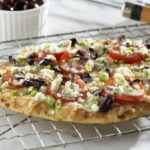 Grilling brings out the rich flavors in Stonefire® Naan to make a tasty simple Greek style flatbread meal. Preheat BBQ or Grill to Medium high heat. Combine oil and Oregano together in a small bowl, brush mixture on both Naan, bubbly side up (set Naan aside), add basil, onions and tomatoes to remaining oil mixture in bowl and toss. Cover and let tomato mixture stand at room temperature for about 30 minutes to blend flavors. 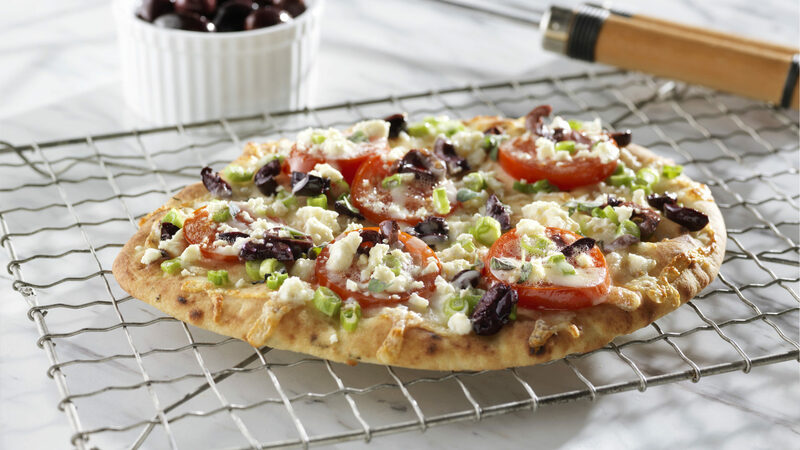 Top the Naan with the tomato mixture, feta and mozzarella cheeses and olives. Place on grill and cook for 5-7 minutes with the lid closed. Rotate the Naan 2-3 times during cooking to get an evenly browned bottom. Cook until the cheese has slightly started to soften.